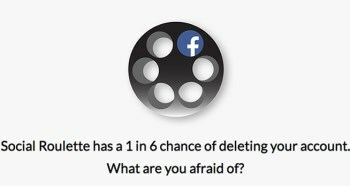 A Russian Roulette-style app that had a one-in-six chance of deleting a player's Facebook account was a little too much for the social network to bear. We all know how Russian Roulette works, right? A revolver with a single bullet; spin the cylinder, put it to your head, pull the trigger and hope nothing happens. I don't think it actually qualifies as anyone's idea of "fun" (except perhaps for North Vietnamese prison guards) but for a very short while, Social Roulette let you do basically the same thing with your Facebook account. The app offered players who pulled the virtual trigger one-in-six odds that their Facebook account would be entirely deleted; hitting an empty chamber would post a message on your wall saying you'd played and survived (and encouraging others to give it a try) but losers - or winners, depending on how you look at it - would apparently have their "posts, friends, apps, likes, photos and games" deleted, and their accounts deactivated. "Everyone talks about deleting their Facebook account, but we rarely take action. Sometimes we need a simple game to help take the responsibility off our shoulders, and provide a moment for reflection," co-creator Kyle McDonald told TechCrunch. "Social Roulette is more of a provocation rather than a tool." Unfortunately for those seeking abdication of personal responsibility or cheap digital thrills, Facebook very quickly pulled the plug on the whole thing. "It took us four hours to create the project, and it took another four hoursÂ after the launch for Facebook to respond by blocking the API key andÂ restricting our ability to create Facebook applications," McDonald explained. "The app wasÂ flagged by an automated system for 'creating a negative userÂ experience'." Facebook also took issue with Social Roulette's logo, a from-behind view of a revolver cylinder loaded with a single Facebook "F."
There's some question as to precisely which Facebook policy Social Roulette violates but whatever the specifics may be, users can no longer log in with their Facebook accounts, which means the game is over. Not necessarily forever, though; McDonald said he's working with Facebook "to address this and otherÂ issues and expects a return to normal service some time this week."